Newsletter number 3 is scheduled for publication on December 15, 1967. It will be dedicated to S. Foster Damon. We had originally intended to dedicate the present issue to Professor Damon, but have changed the date in hopes of getting more material from his students and colleagues. The deadline for copy will be December 1. 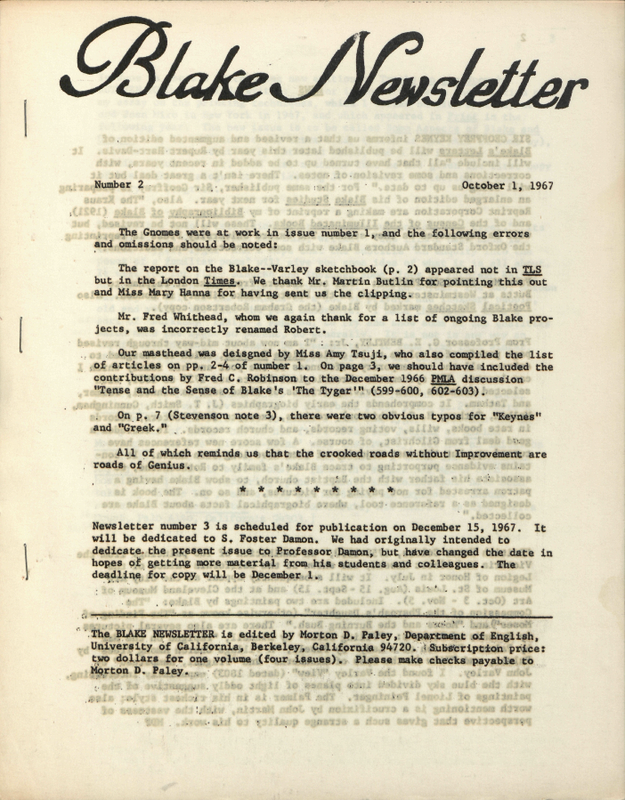 The BLAKE NEWSLETTER is edited by Morton D. Paley, Department of English, University of California, Berkeley, California 94720. Subscription price: two dollars for one volume (four issues). Please make checks payable to Morton D. Paley. One of the pleasantest results of publishing the Newsletter has been receiving letters from many Blake scholars in the U.S. and elsewhere in the world. All too often, I’m afraid, my answers have been shorter and later than I could wish. This situation will probably get worse rather than better, as it would be impossible for me to take the time to answer letters as they deserve and put out the Newsletter, in addition to doing my own work. Therefore I ask the understanding and indulgence of our readers, who have been (and will, I hope, continue to be) generous with their contributions of material and comment. This winter I expect to be travelling to a number of Blake collections, and although mail will eventually reach me, forwarding may take as much as two weeks. It would be helpful if readers marked Newsletter correspondence “Blake Newsletter” in the lower left hand corner of the envelope. In that way, I can make whatever special arrangements are necessary more easily. The deadline for copy for the next issue is December 10.